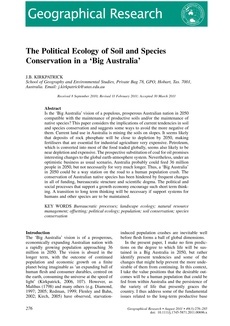 Is the'Big Australia' vision of a populous, prosperous Australia nation in 2050 compatible with the maintenance of productive soils and/or the maintenance of native species? This paper considers the implications of current tendencies in soil and species conservation and suggests some ways to avoid the more negative of them. Current land use in Australia is mining the soils on slopes. It seems likely that deposits of rock phosphaate will be close to depletion by 2050, making fertilisers that are essential for industrial agriculture very expensive. Petroleum, which is converted into most of the food traded globally, seems also likely to be near depletion and expensive. The prospective substitution of coal for oil promises interesting changes to the global earth-atmosphere system. Nevertheless, under an optimistic business as usual scenario, Australia probably could feed 36 million people in 2050, but not necessarily for very much longer. Thus, a 'Big Australia' in 2050 could be a way station on the road to human population crash. The conservation of Australian native species has been hindered by frequent changes in all of funding, bureaucratic structure and scientific dogma. The political and social processes that support a growth economy encourage such short term thinking. A transition to long term thinking will be necessary if support systems for humans and other species are to be maintained.